The 'Third' kit is an interesting phenomenon. Born out of necessity because the colours on a home or away kit clash with the opposing team (unlikely, you'd have thought), it's now become a license to break as many design rules as the manufacturer sees fit. We think of Third kits as being a modern-day entity, but look hard enough and you'll find various examples worn by clubs going back many decades... and they're no less wacky in their execution either. 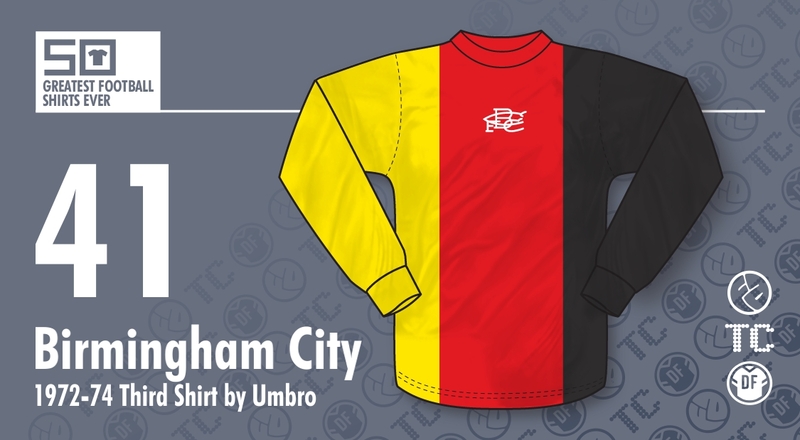 One of the ultimate examples of Third kit theatricality can be found as far back as 1972 when Birmingham City wore a shirt featuring the colours of the West German national flag - black, red and yellow. But be not mislead: this wasn't, for instance, a red shirt with black and yellow trim, oh no. It was a shirt divided equally into thirds - yellow on the left, black on the right and red down the middle. Legend has it that this bizarre cavalcade of Teutonic hues came about when Birmingham City went on a pre-season tour to West Germany, a PR stunt designed to ingratiate the St Andrews club with their foreign hosts. Be it true or not, the shirt found its way into the Blues' dressing room on several occasions over a two year period for league games against Tottenham, West Bromwich Albion and, as you can see from the video below, Queens Park Rangers. On a practical level, one could argue that the shirt was not without its problems. Depending on which direction the players were running in, you'd be excused for thinking they were wearing black shirts going one way up the pitch and yellow ones going the other. Not only that, but when the players lined up in a wall for a free kick, they looked like a Munich marquee during Oktoberfest. But let's not be distracted by such trivial details. Instead we should marvel at the sheer audaciousness of Umbro to create a shirt whose combination of colours were rarer than an admission of guilt from Sepp Blatter and as subtle as a hedgehog in your underpants. Football shirts don't have to be modest and safe in their design, although many modern-day manufacturers would have you believe otherwise. They should open your eyes and make you gasp at their distinctiveness and individuality. Birmingham City went boldly into battle upon hearing this rallying cry. Who else has had the bravery to wear such a fine football shirt since?